Indians roll into Class A North semifinals. 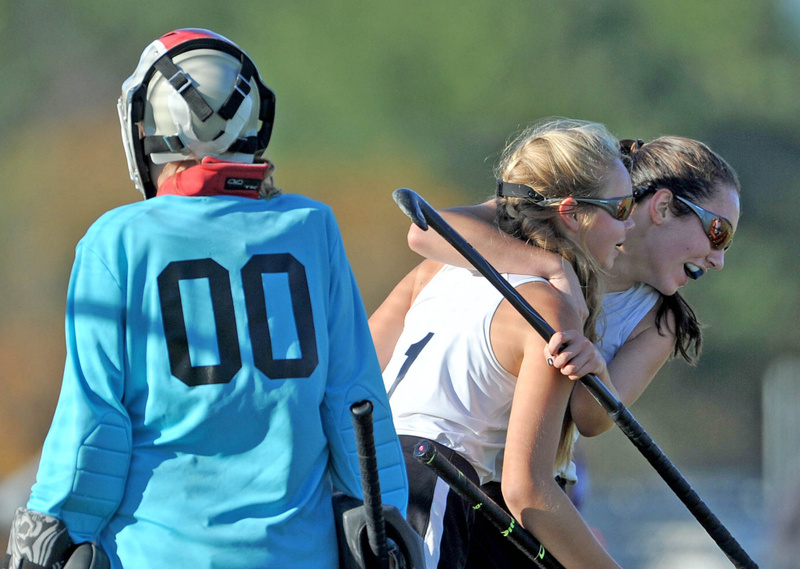 Staff photo by Michael G. Seamans Skowhegan’s Maliea Kelso, back, celebrates with teammate Julia Steeves (1) after Steeves scored against Hampden Academy during a Class A North quarterfinal game Wednesday in Skowhegan. SKOWHEGAN — The game plan was spray painted on the grass in front of the Skowhegan bench in school colors: Attack, attack, attack. 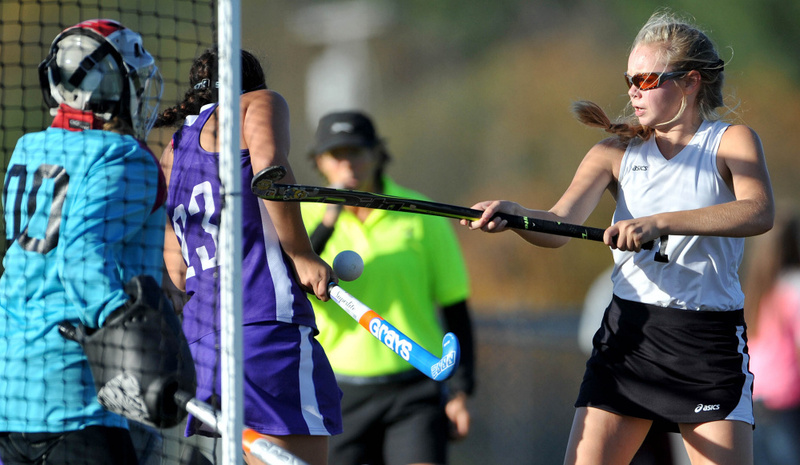 The Indians took those instructions to heart Wednesday as they rained 38 shots on the Hampden Academy defense and goalie Ruby Ramsay en route to a 10-0 victory in a Class A North quarterfinal field hockey tournament game. No. 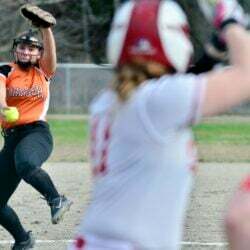 2 Skowhegan (13-2-0) moves on face No. 3 Cony in a semifinal game Saturday while No. 7 Hampden finishes at 6-8-1. These teams played a fairly competitive game early in the season with Skowhegan winning 3-1. But the young Indians have come a long way since. 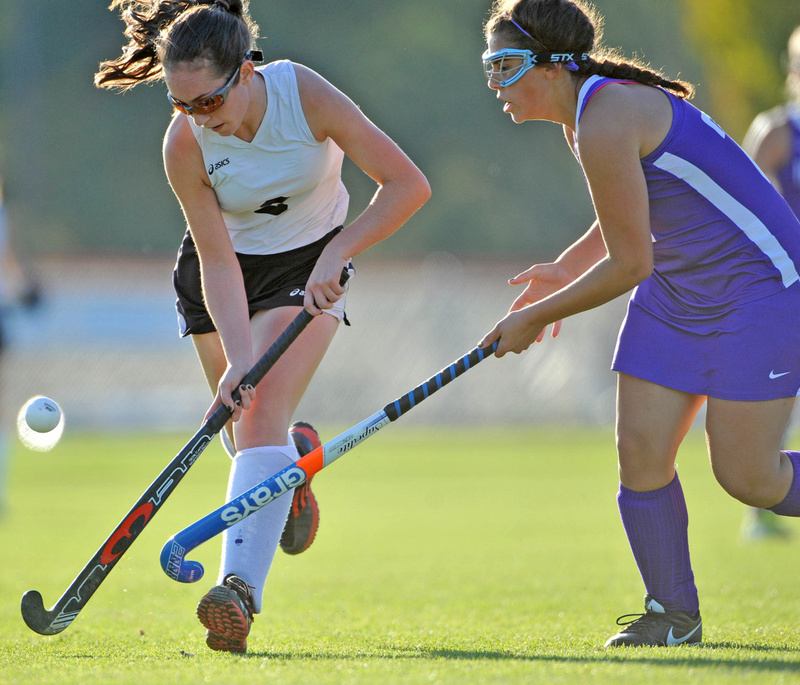 Sophomore Julia Steeves scored three goals while freshman Maliea Kelso scored a pair of goals and assisted on two others. The Indians ended their offensive explosion fittingly as Mariah Dunbar scored the 10th goal of the game assisted by fellow freshman Elizabeth York. The Indians scored four times in the first half and six in the second. The Broncos got a couple of penalty corners in the first, although they were unable to put a shot on goalie Leah Kruse. In the second half, they didn’t even get the ball into Skowhegan’s penalty circle. It did take the Indians awhile to get going. 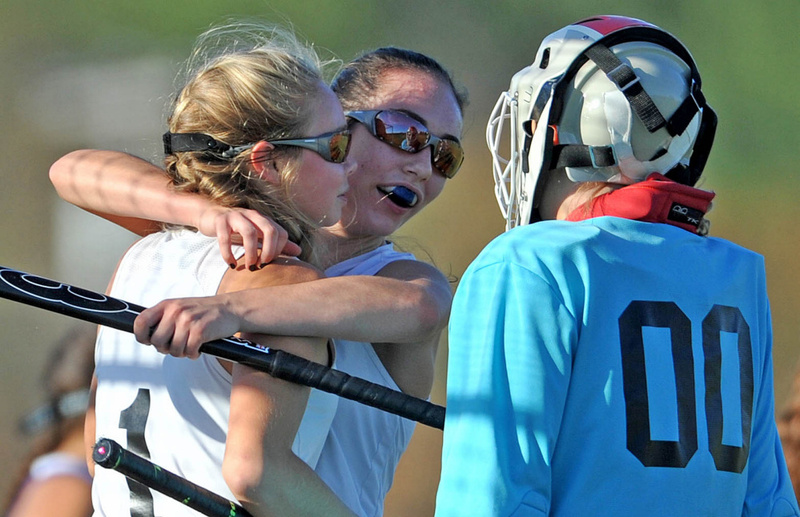 They didn’t score until Kelso redirected a pass from Cassidy Clement into the cage with 14 minutes, 32 seconds left. Steeves scored the first of her three goals to make it 2-0 off an assist from senior captain Lauren LeBlanc then LeBlanc blasted a shot from 18 yards out that echoed off the back of the cage. Kelso, who moved from midfield to forward in the second half, crossed another long pass — this one to Michonski — to make it 5-0 early in the second half. Later in the period, Michonski returned the favor, making a nice solo run down the left side and crossing to Kelso for a score. The roof fell in on the Broncos in the final five minutes despite several good saves by Ramsay, who finished with 25. Steeves, Clement, Michonski and Dunbar all scored over the span. Michonski’s goal was notable in that she dribbled from nearly midfield and dodged three defenders before flicking the ball into the cage.